My life has been a challenging journey so far, but I honestly wouldn’t want to go back to change one thing about it. Each hardship endured, each goal and achievement reached has made me the person I am now, in this moment. Admittedly, for awhile it seemed that the whirlwind of negativity was out of control. And I believe that it probably was, at least for a little while. Failed relationships, broken hearts, stress and loss from every perceived angle. It was very easy to play the victim for some time. Without those experiences though, I would never have truly understood how difficult it is for someone suffering from anxiety, depression and PTSD to simply relax and be present. To struggle in remaining spiritually in tune and even to meditate for more than five minutes. When any unexpected noise jolts you from your focus and throws you into a terrorized fight mode. To jump out of your skin over something as innocent as a car door…heart racing, hands shaking, irrationally fearful that someone is going to attack you. Some days you just pray for an end to it all, in whatever way is necessary. Those that haven’t been through the experience will never truly be able to understand it. So for that, I am thankful…another layer of compassion activated, a new and unique way to understand the suffering of others. Thankfully we are surrounded by loving soul sisters and brothers to remind us of our divinity and strength. To shine a light in our darkness and gently guide us toward our truths. I am so grateful for all of these souls, even the negatively perceived ones, because we learn so many valuable things about ourselves that way. The biggest lesson I’ve come to is that you must always be 100% transparent and honest about your feelings, especially in a romantic relationship. You can’t bottle all of your feelings up or try to mask yourself to fit other’s perceptions and expectations of who you are or who you should be. If you don’t have any love or respect for yourself, you can always expect that others will disrespect you. If you never set any boundaries with others, they will always be crossed. The only way you will ever be with the right person, the one who will really help you reach the stars and stretch beyond all your limitations, is by being who you truly are and allowing them the same. Being kind but truthful. Embodying everything you love and hold dear on every step of your path, never faltering because of someone else’s opinions, but doing so from a place of love, compassion and honor. Knowing that your thoughts and words 100% dictate how your life progresses, the people and situations you attract, puts the power of positivity back in your own hands. The power to direct your life in a direction that makes your heart expand, your soul stretch and your feet dance. This life is full of joy, love and peace because that is who we are, if only we will remember with our hearts instead of our minds. We can only truly heal one another by understanding and empathizing with other’s feelings. This is my purpose in this life…opening the doorways to hidden feelings in order to heal and cure the physical manifestations they’ve become. I believe there is no single true way of healing, no “cure-all”. We are all multifaceted and multidimensional beings requiring different techniques to heal our complex souls. I believe a powerful healing combination exists amongst the herbs, teas, crystals, scents and colors. Because of this, I am also a bit of a dabbler in many healing techniques. 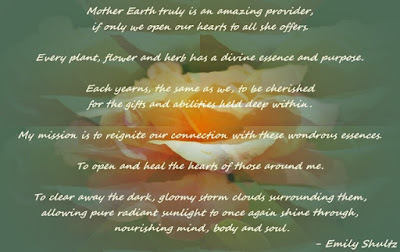 There are so many wonderful gifts on this beautiful planet of ours, each having a uniquely divine purpose and message to share, if only we open our hearts to listen. I am also entirely open to learning and receiving new methods of healing. With that said, this is the beginning of my new blog. plants, as well as highly observant, inquisitive and aware of it’s surroundings at all times. I would like this blog to be a haven for open discussions of natural healing thru subjects that feed the heart and soul. A fantastic knowledge base that people can refer to so that all may reap the benefits of nature’s healing wisdom. The insights I share will likely be very raw but full of truth and love in the hopes that it will reach others and heal the parts of their hearts that have been sealed off from the world. So please, come sit with me, have some tea, and listen to the whispers in the trees.